More Isn't Always Better | BEST Consultants Martin Gerskup Architect Inc.
By Bill Roth, Roth IAMS & Alex Bouchard, BEST Consultants Building Science Engineering Inc.
A fundamental truth which has come to our attention time and time again is that having consistent and defensible data is vital to an Asset Management (AM) program. The challenge faced by organizations is always the question of “What data do I need?” There are a few common misconceptions on this matter that we’d like to address in this publication. The more data the better…..Unfortunately Not! One of the earliest decisions that an organization has to make is also one of the most critical for the long-term success of its AM program; selecting the type of data and the level of detail required to create an effective AM program. This decision will provide the foundation for future benchmarking, analytics and reporting, to the benefit or detriment of the AM program. As outlined on the adjacent Integrated Asset Management Framework, before an organization selects its dataset, it should first explore its critical business objectives and current processes, as well as consider how the AM program will complement and impact them. With a clear understanding of how the AM program supports the overall organization’s success, the next step is to determine the data required to make educated decisions and provide an efficient and effective program. Even if the cost increase is slight for a single building, when multiplied across a larger portfolio the costs can be significant. Money invested in a proper assessment program is critical, but every dollar spent on extraneous data collection is unavailable for actual asset renewal. 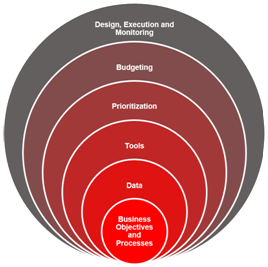 If the data does not support the organizational business goals and processes, then the data will add no value to the organization and may become a hindrance. In order to maintain the integrity and viability of the program, whatever data is collected will need to be kept up-to-date. As such, the more data is collected initially the more resources will be required to keep it valid. Unfortunately, this is often underestimated and results in the failure of many AM programs. It quickly becomes evident that an effective Integrated Asset Management Program requires an on-going element of monitoring and evolution in order to keep it aligned with the organization‘s objectives. As such, careful consideration of what foundational information is required to create and implement the AM program is vital as this decision will establish the resources necessary to keep the program effective. How confident are you that your data collection program results in an effective AM program? For more information you can contact the authors at bill.roth@rothiams.com or abouchard@bestbse.ca.